Joining us today is Jean Scholtes, Founder and CEO of KIND soap company. KIND soap company creates truly natural bath, body, and beauty products with a mission to always be KIND to your skin, KIND to the earth, and KIND to others. Recently, KIND soap company was selected by Capital Innovators to be one of six companies in their Business Accelerator program. KIND was selected from nearly 500 applicants from 56 countries. How did she go from BASEMENT to becoming a ... See More solid BRAND? What Jean has discovered in her evolution from corporate career to entrepreneurship. What Jean's marketing and design background contributes to your current role and business. Jean has extensive experience with market research and new product development. How does approach those areas with her own company. 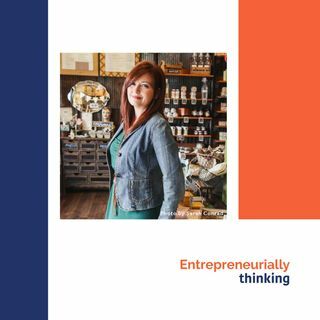 How her life changed personally since she's become a full-time entrepreneur. As well as the surprises. Jean's experience with Capital Innovators. How she became a candidate. Jean's encouragement for other entrepreneurs to find and pursue opportunities.